How can you ensure that your company stays competitive, even in an ever-changing, technology-driven market? The answer to this question is an exceptional website that draws visitors and converts them into customers. That process starts with the right design. At Smartz, our team is made up of designers who know their industry inside and out and are ready to help you with a new or redesigned website that will enhance your marketing efforts. See the content - Even visual content, like videos or images, needs to be woven into the design with tags and code that the search engines can crawl. Crawl through links - Keep your pages linked in a logical pattern so the search engines can navigate all the pages. Notice keywords - Keyword research is critical to designing websites as it allows the search engines to know what your website is all about. At Smartz, our web management team is made up of SEO experts. This means we are able to create a design that works with the search engines to keep your site at the top of the search engine rankings. The hot topic among modern web professionals is that of the mobile use of websites. The majority of business to consumer websites (other than B2B or business to business) have over 60% of their audience viewing their site on mobile devices. We’ve even seen up to 80%! Each day, an increasing number of people opt to use their phones to navigate the Internet, rather than their computers. People on phones are also often more ready to make a purchase than those on computers, yet are deterred when your website is difficult to browse on mobile. Mobile-friendly websites offer simple navigation and less text to fit on smaller screens. They also have faster load times, which is important when people are using spotty connections to access the web. At Smartz, we offer a two-part strategy for creating mobile-friendly websites. The first part involves responsive design. Responsive design creates a website that automatically adjusts according to the size and orientation of the screen used to access the site and is optimized for mobile use. With responsive design, your site remains in your domain name but is still optimized for the optimal user experience. The second part involves creating a mobile app if necessary. Businesses that truly want to focus on the mobile platform often incorporate this second part. Whether your goal is mobile focused or not, we will guide you based on the data of your customers and offer the best solution. 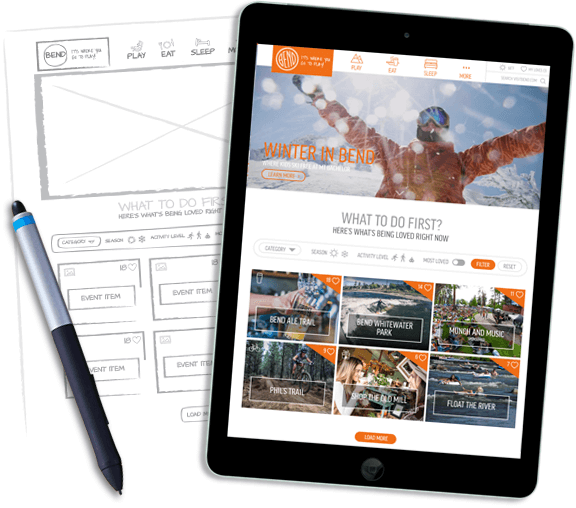 From there, we create wireframes to outline the site structure and calls to action. Once approved, the project comes to life - inspiring the future of your company vision. Smartz web services offer optimized, responsive web design service from a location in the thriving community of Bend, Oregon. Our Bend, OR web design services utilize a local-friendly platforms that allow our design team to create and launch your design project, then gives you control over content and page presentation without the need to understand the intricacies of web development. If you need to add new pages or update content after the initial design, you can do so with ease. When you are our client, our team will leave you with a site that is fully yours to control. Our content management system is fully web-based, so you can change the content anytime you wish. To reach today's customers, you must have a website that is easy to find and navigate. You can have that website with the help of our web marketing company. Contact Smartz today to discuss your branding goals with a designer from our team, and see how easy it is to build a beautiful, modern website that will convert!